The Happionaire book series have become quite the phenomenon. All those who were ever in search of success shall recognise the word ‘Happionaire’ instantly and those who still search for success should. The newest addition to the series Succeed The Happionaire Way will reveal the success principles practiced by some of the world's most successful people in a simple, fun and easy to follow program. Now you too can benefit from these innovative strategies and universal principles practiced since over 5000 years by taking immediate action! 1. Kindly tell your fans about yourself and your book in slight detail. Yogesh Chabria: As a young boy, we couldn’t even afford taking the auto rickshaw and that’s one of the reasons I started selling toys when I was 5 years old. I feel super lucky I was not born rich because I realized I have something even more powerful that can enable me to achieve anything – that is my mind and my own inner power. Since then I have faced lots of challenges, been depressed and lonely, but all that changed once I decided to take action and control of my life. Succeed The Happionaire Way (STHW) is a book like no other, because it doesn’t tell anyone what to do. Instead it helps and inspires them to discover their own goals and dreams and make them a reality. It’s about overcoming your own inner fears and achieving whatever you desire. It is about discovering your own true inner potential – which I believe is truly limitless. 2. You have achieved immense success at such a young age. What has been your inspiration through this journey? Yogesh Chabria: My biggest inspiration has been the teachings of the Geeta and Krishna. He tells me to take action without fear and focus on my goals. When you overcome fear and take action – something special happens. I say this not in a religious way, but in a very spiritual and practical way which we can all apply in our day to day life. I also get inspired by everyone around me, my wife, my son, my parents, my sister, my grandparents, nature. Even a spider and crow inspire me – they work so innovatively and creatively to achieve their goals of obtaining food and surviving. 3. The HAPPIONAIRE series has created quite the stir. Can you share some of your experiences while writing such wonderful books and holding seminars for the same? 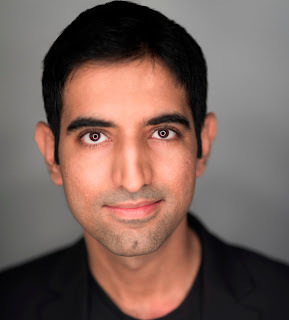 Yogesh Chabria: My writings are all based on my personal real world experiences. There are so many experiences. Each seminar leads to me meeting at least 500 to 1000 people, thus it isn’t hard to find unique experiences. Once a gentleman introduced me to his wife and shared how his relationship with her, which had become extremely painful, was completely rejuvenated after practicing the principles of Happionaire’s Personal Mastery (HPM™). A mother introduced me to her daughter, who had earlier been called a problem child by all teachers at school, but was completely transformed and had now become a star athlete and a great student by using the techniques of tapping into Deep Inner Goals (DIG™) and following the Happionaire’s One Page Execution (HOPE)™ Plan. A salesman told me how he was able to increase his income by over 600% in barely five months, while an entrepreneur was able to increase his companies’ revenues by over Rs. 50 crores in 12 months by applying the strategies of SALES (Smile And Love Everyone Sincerely)™ Mastery, Influence and Persuasion. 4. What were the challenges (if any) that you faced while writing your books? Yogesh Chabria: Challenges are a part of life – without a challenge life becomes boring. For my latest book Succeed The Happionaire Way, the biggest challenge was time, because during the days I was very busy with lots of my Happionaire Seminars. I am lucky to have been blessed with a newborn son, Samarvir, while writing STHW as he ensured I didn’t get much sleep at night. I used this time at night to write STHW! 5. You have been graciously providing people with some excellent advice through your books. What has been the best advice that you ever received? Yogesh Chabria: Never settle for a lesser goal. No goal is impossible to achieve if you truly dream it and work towards it. Don’t let anyone tell you what is not possible for you. 6. Can tell your fans about the book(s) that changed your life. Yogesh Chabria: Of course, the first one is the Gita. Biographies of people Steve Jobs and Mahatma Gandhi has also impacted my life a lot. I have learnt the power of sales, marketing and having belief in one’s own ideas. I also realized that is important to give back to people around you, when you give back you attract a lot more! 7. By your personal standards how would you define and measure success? Yogesh Chabria: If you are happy doing what you are doing at every level – personal, mental, emotional, physical, financial and spiritual – then I believe you are successful. If you have complete peace of mind and have overcome doubt, lack of confidence and fear, than I believe you are successful. Each one of us has to be true to our own definition of success. 8. And the last question that all your fans eagerly wish to know what can they expect in the future (perhaps another mind blowing masterpiece)? 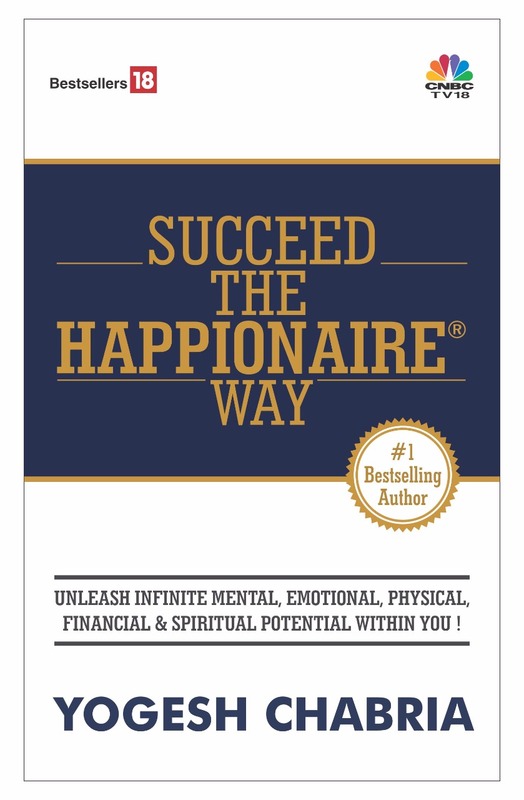 Yogesh Chabria: Succeed The Happionaire Way is a book which I believe will have the maximum impact. I would want it to bring real change in the lives of even more people. With a seminar, we can reach maybe 5000 or 10,000 (when we do it in large stadiums) people at a time, but with this book, I want millions of more people to benefit from The Happionaire Way. I want them to know the biggest masterpiece in the world is their own life and all they need to do is take action. I am living proof of what the power of dreams and action can do! If I can do it – anyone can!